But after five days in the little England of Victoria, he changed his tune emphatically. "You think B.C. means before Christ,"; he wrote, "but it doesn't. I'm sitting, wildly surmising, on the edge of the Pacific, gazing at mountains which are changing colour every two minutes in the most surprising way. Nature here is half Japanese. "; He also foolishly wrote, "It is an empty land. A European can find nothing to satisfy the hunger of the heart. He requires haunted woods, and the friendly presence of ghosts... the decaying stuff of past seasons and generations." Paul Delany has produced a fascinating study of sexually ambivalent Rupert Brooke, described by W.B. Yeats as "the most handsome man in England." 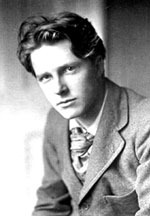 Fatal Glamour: The Life of Rupert Brooke (McGill-Queens $37.95) is Delany's follow-up to Delany's George Gissing: A Life as well as his much earlier overview of an era, The Neo-Pagans: Rupert Brooke And The Ordeal Of Youth (The Free Love Press, 1987). Brooke's rhapsodic style produced a few sonnets that naively romanticized the war effort soon after he went overseas, but never saw action and died in the Aegean due to blood poisoning. Brooke is nonetheless remembered in the annals of English literature as a "war poet" who inspired patriotism in the early months of the Great War. According to succinct publicity materials: "Rupert Brooke (b. 1887) died on April 23, 1915, two days before the start of the Battle of Gallipoli, and three weeks after his poem "The Soldier" was read from the pulpit of St Paul's Cathedral on Easter Sunday. Thus began the myth of a man whose poetry crystallizes the sentiments that drove so many to enlist and assured those who remained in England that their beloved sons had been absolved of their sins and made perfect by going to war. "In Fatal Glamour, Paul Delany details the person behind the myth to show that Brooke was a conflicted, but magnetic figure. Strikingly beautiful and able to fascinate almost everyone who saw him - from Winston Churchill to Henry James - Brooke was sexually ambivalent and emotionally erratic. He had a series of turbulent affairs with women, but also a hidden gay life. He was attracted by the Fabian Society's socialist idealism and Neo-Pagan innocence, but could be by turns nasty, misogynistic, and anti-Semitic. Brooke's emotional troubles were acutely personal and also acutely typical of Edwardian young men formed by the public school system. "Delany finds a thread of consistency in the character of someone who was so well able to move others, but so unable to know or to accept himself." Letters From America (1916), introduction by Henry James.